The artist equates the pot with the body of the Avatar, and the water in the pot with the lifeblood of divinity taking form on Earth. Sathya Sai Baba Himself comes in form, and as the very water which fertilises the world and brings hope to a spiritual desert. 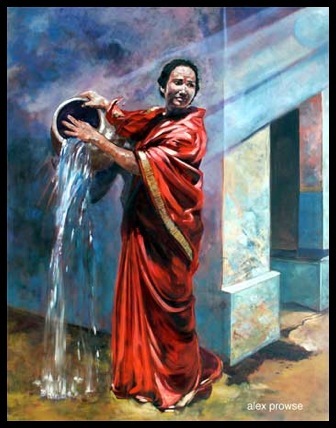 The water cascading to the floor when she falls signifies the blood of divinity splashing on the ground, satisfying Mother Earth’s need for divinity, and preparing Her for a new age of enlightenment in humanity on earth. 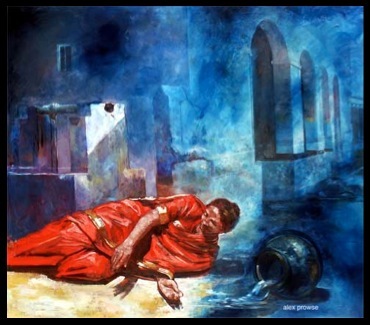 In the final painting, as Easwaramma lies on the ground consumed by Bliss with the blue light now inside this frail human body, we can look to the right of the painting and see the pot depicted. It lays on its side, significantly not broken but whole, as the last of the water pours onto the ground of Mother Earth. Divinity will be restored in the world; an era of bliss will once again reign. The age of the Sathya Sai Avatar is about to take place in the world of consciousness. The paintings before you should be viewed with the freshness and wonder and openness of a child; with the innocence of the unworldly. The three works depict the advent of the Avatar. 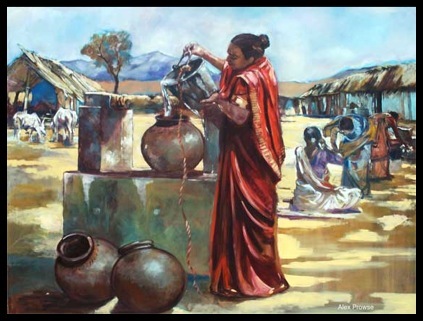 In the first painting, Easwaramma, Sai Baba’s mother, goes about the mundane work of filling water pots for the household. The second of these three paintings depicts the divine light rushing towards the unsuspecting mother as a ball of blue light; in the third, we see her having fainted from the impact. Easwaramma herself revealed this story publicly, and Swami verified it. As He said, His advent was a Descent of Divinity -- an Immaculate Conception – and not a normal human conception.